Among boots winter 2013, we love the models ethnic style with their beautiful patterns woven mixed with leather or suede. 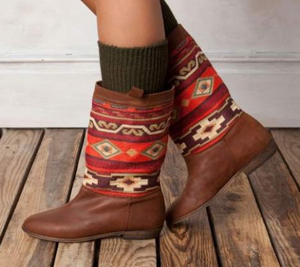 Where can I find a great pair of boots ethnic? Antik Batik itself as one of the marks references on the subject, but you also unearth ASOS, Minelli, or at a lower price in the Spanish label Pull and Bear. Thigh boots black suede front and behind Aztec textile motif (ASOS, € 142.17 with free shipping). Ethnic red flat boots (pull and Bear, € 79.99). Kiboots black leather part high woven multicolored (Minelli, € 139). Boots brown leather and printed fabric ethnic wooden cone heels (Dalia Boots, Antik Batik, € 312). How to wear? Both with shorts that over jeans or near the body associated with a short dress. Cowboy: it-new Isabel Marant shoes?